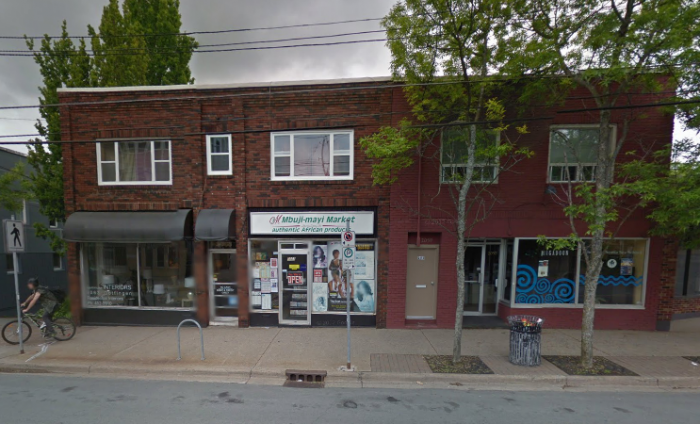 The Community Carrot has purchased a building to house a new cooperative grocery store in Halifax's North End. The building, at 2063 Gottingen, is currently home to Mbuji Mayi Market and Kevin Muise Interiors. The Community Carrot will take over the building in March, and combine the two storefronts to house the new fresh food store. The goal of the Community Carrot is to provide fresh and affordable food to a neighborhood that has lacked this service for a long time. "This has been a five year odyssey," said board chair Norman Greenberg at the announcement Tuesday night. 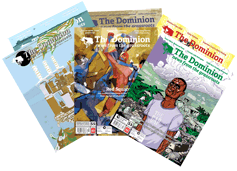 "The board has worked extremely hard. There were many issues, many challenges. To have turned this win of $115,000 into the purchase of a building [is] astounding, wonderful." 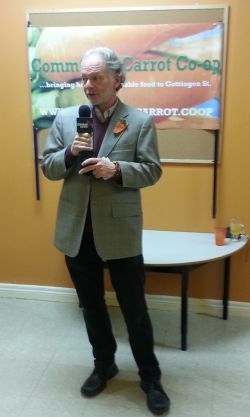 In January the Community Carrot won $115,000 from the Aviva Community Fund, in part through the online voting efforts of residents and supporters. 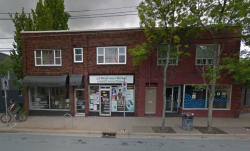 The coop also secured loans from Halifax Community Investment Fund ($100,000) and the Vancity Resiliency Fund ($150,000), and a mortgage from the Community Credit Union in Truro. The Community Carrot will sell memberships under a cooperative model, but the store will be open to anyone to shop. "Only the commitment to shop there will keep it going," said board member Cathy Carmody. Submitted by Brad Vaughan on mer, 12/04/2013 - 17:37. I guess I don't know the details, but, uh, what's the story with the new building ownership, and this Mbuji Mayi Market place? I'm not saying one thing or another, but my "spidey sense" is tingling, and I'm like, "Community" group that can afford to buy a building in a gentryfying neighbourhood displaces small Africentric store? Uh . . . uh . . . no really, can somebody explain this to me? I think it is about time! Submitted by kendall worth on lun, 12/09/2013 - 16:04. Hello, I think it is about that Gottenigen Street is getting a new grocery store. I had just moved to Gottenigen Street the end of this past Summer. Within short walking distance their is everything-else as in stores and services, however no major grocery stores. I had known the area for years and the whole time I had known the area, no major grocery stores. It is about time.